Maybe you have completed a Snowdon trek and would like to go off the beaten trek and expand your knowledge of this rugged area. These alternate treks will take you to the next level and allow you to gain valuable mountain experience, in clear conditions these treks are straight forward but in poor visibility the navigation can become quite challenging. Below are a few examples of what I have available but please feel free to let me guide you on any mountain of your choice in Snowdonia. The views from many of these summits are sensational but do not take my word for it, come and see it for yourself. This trek initially follows the same route as the Devils Kitchen trek but instead of going north to Llyn Cwm we initially go in a southerly direction up a steep and challenging scree slope (are you up for it?) to gain the main plateau. You will probably have never encountered terrain like this before, some people describe it as a luner landscape please come and see it for yourself to see if you agree. 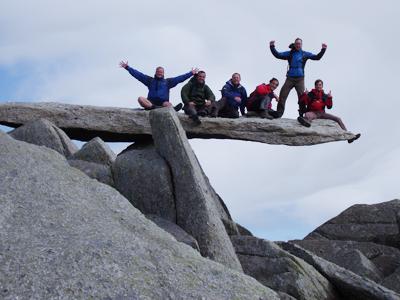 After trekking to Glyder Fawr and onto Glyder Fach we reach the iconic Cantilever stone, which presents us with a fantastic photo opportunity. We then have the option of a number of different descent routes to complete what is a fantastic day out. If you have visited Llyn Idwal in the Ogwen valley you will not have failed to be impressed with the huge headwall at the back of the cwm. 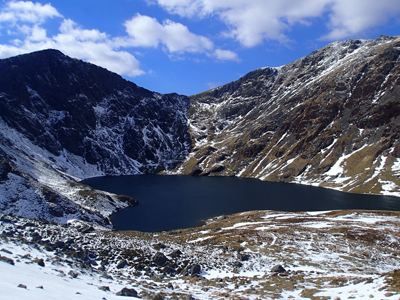 This trek will take us nice and steadily to the top of the headwall with a bit of easy scrambling and onto a small picturesque and secluded lake known as Llyn Cwm then we continue to the summit of Y Garn at a height of over 3,000 feet. Our descent route takes us around Cwm Clyd with views across to Tryfan and down the Ogwen valley before eventually joining the path we originally used for our ascent on the shores of Llyn Idwal. This trek is a full day out over rough terrain trekking to the 3 highest summits all over 3,000 feet on the remote Carneddau mountain range. We start in the Ogwen valley and follow a stream upwards then just before reaching the lake of Ffynnon Lloer we scramble up a small but steep gully to gain the ridge which takes to the first summit of the day Pen Yr Ole Wen. With most of the height gain now out of the way we then trek to Carnedd Dafydd then turning north east we follow the cliff edge of Ysgolion Duon (known locally as the black ladders) with huge drops into the valley far below. 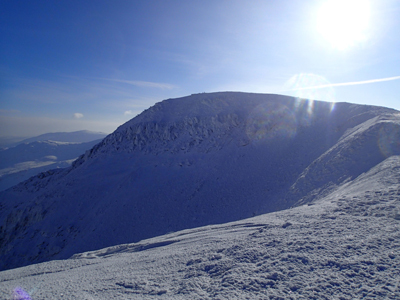 Our final summit of the day Carnedd Llewelyn is now in front of us. After reaching this summit we then descend a remote faint path, which eventually takes us down to the Ffynnon Llugwy reservoir, at this point we reach a very easy path, which takes us back into the Ogwen valley. 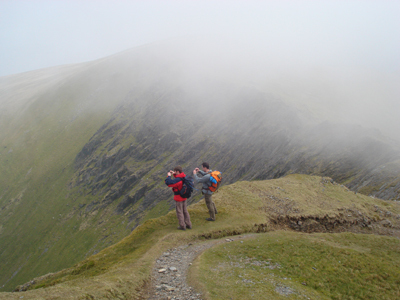 This trek is for experienced walkers with some previous low grade scrambling experience. This trek circumnavigates the Marchlyn Mawr reservoir that is nestled high above Llanberis, which supplies the water for the hydroelectric power station known as Electric Mountain. We will start at a very quiet location, which makes this trek ideal for a bank holiday or a busy weekend. 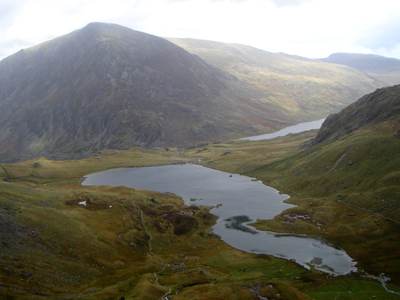 We will trek to 4 lovely summits Carnedd Filiast, Mynydd Perfed, Elidir Fawr and Elidir Fach with gorgeous views in all directions including down the Nant Francon valley, across to Snowdon and even as far as Holyhead mountain on the isle of Anglesey. 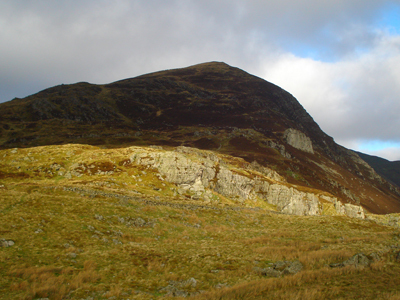 This trek is among my favourites, based in Southern Snowdonia near the village of Dolgellau. If you are staying in Northern Snowdonia e.g. Betws y Coed this is not a problem as I am happy to pick you up for a small extra cost and drop you off later. We will be following the Minfford path for most of the way, trekking through some woods with a stream on our right until Llyn Cau comes into view. We then rise steeply to gain the main ridge which circumnavigates the lake with very steep drops to our right, upon reaching the summit of Penygadair we will come across a bothy (small stone hut) where legend has it that if you sleep in it overnight you will wake up either a poet or a madman. We then trek to Mynydd Moel and descend a faint path to a small bridge crossing the stream which joins the initial path we used for our ascent. If you have walked along Llanberis high street you will probably have looked up at the lovely ridge line in the south west direction (opposite direction to Llyn Padarn). This circular walk I have named the Eilio Horseshoe, taking in the summits of Moel Eilio, Foel Gron and Foel Goch and then descending a very quiet valley which takes us back into Llanberis. This trek is mainly on grassy slopes so is easy going underfoot and on a clear day gives lovely views of the peaks on Snowdon’s southern side.